"The name of the city from that day shall be. The Lord is there." — Ezek. xlviii. 35. A STRANGE picture was that which Ezekiel beheld in vision — a land without inhabitants, a city without citizens, a temple without priests, a ritual without worshippers. Wonder has been expressed as to what Ezekiel, this priest in a prophet's mantle, as he has been called, signified by the picture It has been suggested that he wished to out line a new civil and religious programme for the home-coming Jews when their captivity should close. But against this stands the fact that not a single point in the vision-programme was adopted by the Restoration leaders. The land was not divided as Ezekiel recommended. The Temple was not built according to the prophet's plan. The ritual was not ordered as the exiled priest suggested, but as Moses had enjoined. The city was not constructed as the clairvoyant architect proposed. Clearly Ezekiel's vision was designed to be a sketch, in such language as could then be understood, of the larger civil blessings and purer religious worship that were to be enjoyed by Israel in foretaste when the new era dawned in the home-coming of the exiles; in large measure when the Prince, the second David, should come to dwell among His people and set up His spiritual Temple, the Christian Church; and in fulness when the children of God now scattered abroad should be gathered home to the Eternal City. Regarding the vision, then, in this light, we may see in it a picture of what earthly cities or states should be, but as yet are not; of what religious communities or Christian Churches might be, and perhaps are in imperfect measure; and of what the celestial society or heaven cannot but be, and will be in complete realisation. In other words, it furnishes a sketch of the ideal city or state, of the ideal Church or religious commonwealth, and of the ideal kingdom or heaven. "The name of the city from that day shall be Jehovah-Shammah, — the Lord is there." (1) That the land of a country belongs to its inhabitants. This does not mean that in every instance the land of a country should be divided up amongst its inhabitants, except where this is practicable and the best way of providing for the wants of its population, as possibly it was in Palestine. Neither does it signify that private property in land is wrong and ought not to be permitted in an ideal state, and, contrary to this, that all land should be nationalised and held by the Government of the day for the people. Such a method of dealing with the land is quite conceivable, though whether it is the best way of utilising the land is debatable. What the proposition imports is that where the land, as in modern communities, is handed over to a special class of persons to cultivate and develop, while others are employed in handling its products, whether grain or minerals, collecting, manufacturing, and distributing them, the primary ownership of the land resides in the people, and absolute property in it does not belong to those who enjoy the tenure of it. These are properly trustees of the land for the people, and while they ought to be adequately remunerated for their trusteeship, they are not entitled to disregard the people's rights and to say they can do what they please with the soil — can divert it from cultivation into deer forests for their own enrichment, or demand exorbitant prices for its use when required by the community. That these things have been done with the sanction of human law is true; whether they have the countenance of Divine law, which regards not the profit of the individual only, but also the welfare of the community, is another matter. (2) That so long as civil government is an ordinance of God" the inhabitants of a land are under obligation to supply it with means for discharging its administrative duties. This may be done either by setting apart Crown lands for the support of the prince and the expenses of civil government, as among the Hebrews, or by taxation levied from the people's resources, or, as in our country, by both. So self-evident is this proposition that it should never have been disputed — least of all by Christians, whose Master has enjoined them to " render unto Cæsar the things that are Cæsar's,'' and whom one of Christ's apostles has counselled, saying, " For this cause," — i.e. because the civil magistrate is a minister of God for good, — "for this cause, pay ye tribute also. Render to all their due: tribute to whom tribute, and custom to whom custom." Yet persons are not wanting who endeavour to evade this duty: some counting it no sin to render false returns to the Surveyor of Taxes, forgetting that in so doing they are violating a Divine commandment; and others endeavouring by all means in their power to shift the incidence of taxation from their own shoulders to the shoulders of those less able to bear it. But if taxation for the purposes of government is legitimate at all, it is only an elementary principle of justice that it should be proportioned according to the ability of those who have to pay — "that the poor should pay according to their poverty and the rich according to their riches. By that rule Christ expects the contributions of His people for the support of His kingdom to be regulated, and a state which acts on that rule follows the best of examples. (3) That all who live within a land or city should take an interest in its affairs. In Ezekiel's vision-city it is noticeable that while the tribes were distributed over the land, detachments for the city's business were drawn from all the tribes, which signified that those who should be selected to serve the city were not to be taken from a privileged class or tribe, but from all tribes and classes indiscriminately, or that the tribes should send up in turns representatives to conduct the city's business, as the Priests and Levites in their orders went up in succession to serve the Temple. In either case, the thought is that the government of the city should be the care of all the people, through their representatives, and that those representatives should serve the state or city, not themselves. A much needed lesson for parliamentary representatives and town councillors at home! Never perhaps more needed than to-day, when the most momentous problems are waiting for decision — problems that concern the liberties and welfare of the people and that will affect the history of this country for generations to come. (4) That an ideal state or city should care for the interests of religion, This was done in Ezekiel's vision-programme by the erection of a sanctuary for the worship of God, and by making ample provision for those who ministered in holy things. The underlying thought is, that the people of a state or city should care for the interests of religion by erecting places of worship where these are required and providing for the maintenance of a gospel ministry; and this the people would do were they all themselves religious. Until they become religious, those who are must see that the worship of God is maintained and extended in the land, not merely in the sense of having sanctuaries built in God's honour:, but in the higher sense of securing for Him a place in the hearts of its people and a voice in the management of its affairs — io the legislation that proceeds horn its council chambers, in the trade and commerce that are carried on within its walls, in the amusements and recreations in which the people indulge, in the friendships and associations which they form, in the homes and at the firesides of all ranks and classes of the population. Who will assert that this ideal has anywhere been reached? 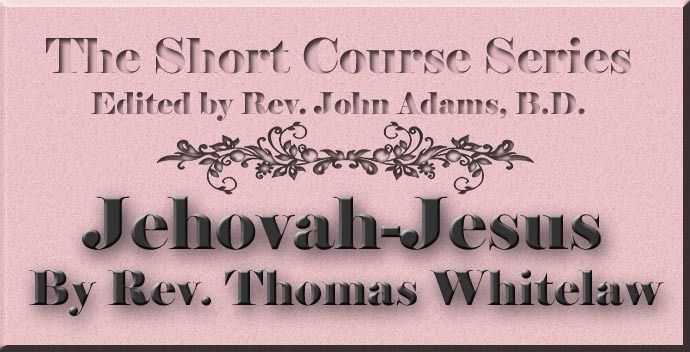 It is true that one cannot wander through the towns and cities of our land, or of Europe or America, without seeing ecclesiastical edifices innumerable in which divine worship is performed with more or less of purity; and if that were enough, it might be said of all of them, " Jehovah-Shammah, — the Lord is there' And a comfort it is that in this sense He is there, even though His. presence is not always realised by the citizens. But when one thinks of the unblushing wickedness, not of our populous cities alone, but of our smaller towns and villages as well, of the violence and immorality, the drunkenness and gambling, the dishonesty and profanity that too often prevail within them, one cannot help observing that even the best of them is far from corresponding to the vision-city of Ezekiel. Yet this should be the aim of all good men, whether philanthropists or statesmen, to make our towns and cities garden cities, and our state a holy land in which God may dwell with men and walk with them, as He did of old in Eden with sinless man. Bring God into the city and into the state and He will cleanse them both; He will purge them of their wickedness, for He is of purer eyes than to look upon iniquity, and evil shall not dwell with Him. But, on the other hand, if He is to come into either city or country, the inhabitants thereof must begin the work of reformation and purgation themselves, must put their hands to the cleansing, not alone of their streets and dwellings, but of their hands and hearts, and so prepare the way of the Lord. When the people of a land address themselves to this work — the refinement of their manners, the elevation of their morals, the purification of their hearts, the reformation of their lives — these other works, the decoration of their dwellings and the cleansing of their streets, will be easily accomplished, and over state and city the name may be inscribed, " Jehovah-Shammah, — the Lord is there." The presence of the Lord in the midst of His Church is one of the certainties of the faith; indeed, without His presence there cannot be a Church. An assemblage of people, a congregation there might be, but not a Church; and precisely in proportion to the clearness with which Christ's presence in the Church is realised and made use of can it reach an ideal condition. (1) Let us inquire in what sense Christ is present in the Church. He is in the Church not merely metaphorically, or by a kind of figure of speech, as in the preaching of the word and in the administration of the sacraments — though in that sense He is there, at least where both word and sacraments are ministered according to the Scriptures. Nor is He in the Church only symbolically " as He is in the Lord's Supper, in which He is evidently or visibly set forth under the elements of bread and wine, as He Himself said to His disciples, "This bread is My body which is broken for you," and again, "This cup is the new testament in My blood," etc. Here, of course, it is hardly needful to remind the reader that Christ is not materially present in the Church, as Roman Catholics and High Anglicans teach when they assert that the bread and the wine are transformed into the body and blood of the Redeemer by the prayer of a priest — a doctrine which all the Reformed and Protestant Churches repudiate as not only unscriptural but as contrary to reason and sense. Different from either of these senses, Christ is present in the Church, not figuratively but really, not materially but spiritually, in the Person of His Spirit, who dwells in the hearts of His people and in their assemblies when gathered in His name. Nor, again, is His presence in the Church only temporary, like that of a wayfaring man who turns in to an inn to tarry for a night, or like a friend who comes in to dwell in a relative's home for a season; but permanently, as one who has made it His habitation. As He said long ago of Zion, "This is My rest; here will I dwell, for I have desired it," so does He say of His Church, " This is My home, My fixed abode. My chosen and My final rest." Nor will any power or potentate ever be able to drive Him out of it. Neither the world's opposition nor the gates of hell will prevail against Him. Not even the unfaithfulness of His people will compel Him to depart. He may at times hide His face from His people, withhold from them the sensible assurance of His presence; but so long as it stands written, "I am with you always," so long may it be written over every true Church, " The Lord is there." (2) Let us ask for what purpose or purposes Christ is in the Church. One of these is — to receive the worship of His people. When God brought His First-begotten into the world He said, " Let all the angels of God worship Him." When that Firstborn tabernacled on earth, men and women compassed with infirmity and burdened with sin worshipped Him. When He took His departure from the world His disciples worshipped Him; and ever since, He has been surrounded in the heavenly world by thousands of angels and redeemed souls who worship Him day and night, casting their crowns before His throne and saying, " Holy, holy, holy, Lord! " From all this it is clear that if Christ is in His Church on earth He is there to be worshipped, to receive their adoring homage, to accept their praises and hear their prayers. And what a light does this cast upon the proper spirit in which the sanctuary services should be performed 1 Where these are carried out simply for the delectation of the hearers, where high-class or low-class music is offered to the congregation instead of to Christ, where prayers are designed to excite admiration for their beautiful language rather than devotion by their spiritual feeling, where sermons are delivered to attract and gratify crowds rather than to produce conviction and lead to conversion, it may be taken for granted that the service is not worship, however ornate, beautiful, or attractive it may be. " God is a Spirit, and they that worship Him must worship Him in spirit and in truth." Again, Christ is in the Church to exercise His mission as a Saviour. "The Lord thy God in the midst of thee is mighty: He will save," said a prophet to ancient Israel. And the like may be said to His Church of to-day. When our Lord died upon the Cross, exclaiming, " It is finished! " the first part of His work as a Saviour was accomplished — that of atoning for the sins of men by the shedding of His blood; so that now nothing of that nature remains for any man to do. But the second part of His work — application of His atoning sacrifice — is still going on within the veil, where He is able to save unto the uttermost all them that come unto God through Him, because He ever liveth to make intercession for them; and in the Church, through His Spirit, to awaken in men's hearts a desire after His salvation and to bestow it upon them that believe. Whence it follows that if men and women come into the Christian sanctuary without the smallest desire to receive from Him the saving benefits He has to bestow, they need not wonder if they go empty away. Again, the Lord is in the Church to help it in its work, both collectively and individually. Individually, the work of a believer is to work out his own salvation with fear and trembling, and for that purpose the Lord, the Spirit, is in him and with him, to lend him all the help he needs, to work within him both to will and to do of His good pleasure. Collectively, the Church's work is to evangelise the world, — " Go ye into all the world," etc., — and as the Lord went with His first disciples confirming the word with signs following, so is He still with the Church, when her preachers are faithful, giving power to their message, making it efficacious both for conversion of sinners and upbuilding of saints. "Its walls, defended by His grace. (3) Let us note what results one would naturally expect to see in a Church of which it could be said, " The Lord is there." In a Church from which the Lord was absent — if such a congregation could be called a Church — one would naturally expect to find great spiritual deadness, great religious inactivity, great unchristian illiberality, perhaps along with great ceremonial splendour; in short, something as unlike a Church of the living God as the spirit of the world could make it. One would hardly expect to see conversions, or hear men asking what they should do to be saved; rather, the dying down of everything like spiritual enthusiasm in religion. But, on the contrary, were the Lord in the Church, we should see the opposite of all these things. Why not? Did not Christ say, " Because I live ye shall live also"? We should find praising and praying and preaching not with the lips only but with the hearts and understandings of the people. We should find the gospel of Christ crucified and risen as the staple of the exhortations given from the pulpit; we should hear of believers growing in grace and in the knowledge of our Lord Jesus Christ, and of sinners turning in penitence and faith to God. We should see a great outburst of Christian activity and a great display of Christian liberality. Instead of empty churches and chapels, these would be full of earnest worshippers whose zeal and enthusiasm would attract those that are without and constrain them to say, " We will go with you, for we see that God is in you of a truth." Instead of Christian workers being few, every department of Christian service would see volunteers pressing forward with the cry, " Here am I: send me." Instead of good causes suffering for want of funds, the Church's exchequer would be running over. And instead of the world's evangelisation proceeding slowly, one might hope to see nations born in a day.